A recent column in The Washington Post began with this line: “The face of the nation’s opioid epidemic increasingly is gray and wrinkled.”1 Throughout the rise in the opioid epidemic and its expansive media coverage, the face of the addict has been the 18-25 year old range; even though the number of opioid users in the 55-64 age range more than doubled during the same time. Studies estimate that by 2020, as many as 5.7 million adults aged 50 and older will have a substance use disorder2. There are many issues involved in the graying of the opioid epidemic. First, the US insurance industry makes it easy to be a substance user, but does not make it easy to be a senior in recovery. Second, prescription opioids are distributed to seniors by physicians, but many are overreacting to new governmental regulation of those substances. Third, there is a special segment of the aging population that has higher levels of difficulty – the rural community. And finally, we need to recognize the difference in the general physical health of the population as we age and we need to address the management of chronic pain for this population. Medicare Part D is the prescription drug section of Medicare, the US government health insurance program covering the senior population. In 2016, about 500,000 seniors covered by Medicare received prescriptions of opioids in the two highest risk categories — those being given extreme amounts of opioids and those who are “doctor shopping” in order to obtain higher pill quantities. 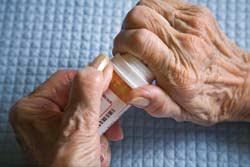 In fact, the average dose prescribed for older Americans far exceeded the manufacturer’s recommended amount. Of great interest is that Medicare is more than happy to pay for opioids like OxyContin and Vicodin almost without question, but does not regularly pay for drug and alcohol treatment or for medically assisted treatment like Methadone and Suboxone. How do the elderly in our world become subject to such substance use? The greatest likelihood is that older adults are much more likely as a group, to experience significant pain and physical illness and are generally prescribed pain medication much more frequently than young people. However, older adults taking opioids are also four to five times more likely to fall. And so starts a vicious cycle. Taking opioids can lead to falls, falls can lead to pain, pain can lead to opioids and opioids can be misused. Historically, the medical community has managed chronic and persistent pain, such as arthritis, sciatica and fibromyalgia, with strong opioid medications like OxyContin and Vicodin, and it is common for those same medical professionals to overlook the fact that older patients can also suffer from substance use disorders. Now, let’s add the special epidemic issues affecting the rural populations and specifically the older members of that population. Many rural communities lack substance-abuse infrastructure and resources. Moreover, rural communities tend to be older populations. According to the CDC, these communities also have a significantly higher overdose rate per capita than urban areas. The bigger issue for the older population in rural communities is lack of education. For instance, it is not uncommon for older people in small towns to not know the serious side effects of painkiller misuse, such as respiratory depression. Yet another issue for the older population is the effect of substances. The aging process includes bodliy changes and the onset of a number of physical health problems. Older adults may not be able to break down drugs as quickly as younger people, placing them at increased risk for toxicity and overdose. Moreover, as older people lose cognitive ability, other issues arise, including dosing compliance. Often overdose arises because the elderly forget having already taken a dose and doubling up unintentionally. Having said all of this, it is critical that we find a way to not react so violently, that the pendulum swings all the way from one side to the other. First we had literally no regulation. As people started dying by the hundreds and thousands, the powers that be woke up and generated regulations governing the use of these opioids. Many doctors, not wanting to be known as someone who does prescribe these medications, have just ceased prescribing completely. As a result, many elderly people who have come to rely on these medications to make them physically viable and not in order to “get high” are being forced to stop using these medications “cold turkey.” As a result, people with chronic pain are becoming more disabled. The current prevalent position is that opioids are bad and everybody who’s on opioids long term is at risk of overdosing, but that is not accurate and as a result, the legitimate pain patient is paying the price. This is forcing the chronic pain patients, most frequently elderly, to find other means to deal with their pain. Many are turning to the streets. They will buy their regular pain medication if they can, but the street price of the medication is exorbitant and then they find out that they can get heroin for much less. Again, this population doesn’t metabolize medication at the same pace as younger people. So the heroin will affect them more intensely and if it is unfortunately laced with fentanyl, they are more likely to be subject to overdose and death. It is incumbent upon us to find a happy medium. Our seniors who are legitimately taking these medications should not be placed in jeopardy in order to meet the international outcry to address the opioid epidemic. 2 Han, B., Gfroerer, J. C., Colliver, J. D., & Penne, M. A. (2009). Substance use disorder among older adults in the United States in 2020. Addiction, 104, 88–96.